The whole point of Valve's Steam Machine idea is that it bridges the gap between consoles and PCs. All the benefits of the PC in a simpler case. One company, however, is slanting a little too heavily towards the console side of the gap. Alienware's flagship Steam Machine, one of the standouts from the early lineup of devices, won't be upgradable. Instantly negating one of the main reasons for buying a PC in the first place. 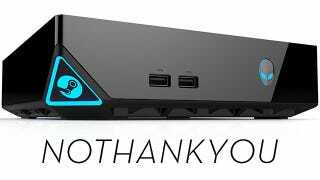 "Lifecycle wise, consoles update every five, six, seven years, we will be updating our Steam Machines every year," says Frank Azor, Alienware's General Manager in an interview with Trusted Reviews. "There will be no customisation options, you can't really update it." Well, that's a nothankyou.jpg on that one then. Those consoles updated every 5-7 years have an entire library of games coded specifically for them. The PC market won't wait for Alienware; it'll keep pushing the same boundaries it always does, which for purchasers of their Steam Machine means they'll start lagging behind just twelve months after purchase. There's no word on price yet for the Alienware Steam Machine; the company only says that "The price will be competitive with next generation consoles."